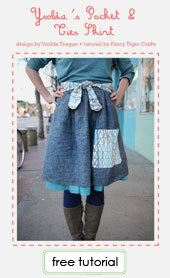 Jane Sassaman is the designer behind my newest obsession - the Prairie Gothic fabric collection. 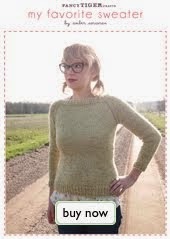 I want to cultivate a new style for myself that is Prairie Gothic, inspired by her collection. It is my new favorite thing. When i see clothes and accessories now, i have to ask myself, "is that Prairie Goth?" We love her design and look at how awesome she is. What an inspiration! Check out this tie made out of the Prairie Goth fabric. HOTT! 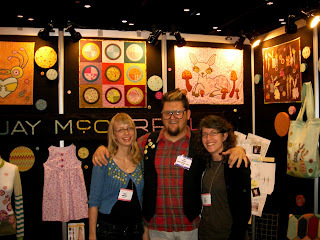 Quilt Market Report (Part II): Is the quilt world ready for Jay McCarroll? You may know Jay McCarroll - he is the winner of the first season of Project Runway and has been taking the fashion world (and Bravo TV) by storm ever since. 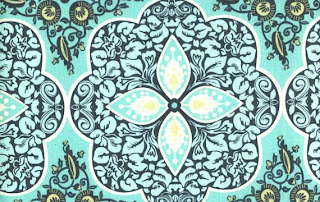 He debuted his new collection of quilting cottons for Westminster fibers at the Quilt Market. We are totally excited about his fabrics (which will be here in March), but I'm not sure the quilt world is ready for him. Our Westminster rep referred to him as "er, Jay Smith?" when showing us the line, and when Jay won an award for best new booth, he was announced as "Jay Caroline". Hopefully everyone will learn his name because his fabrics are super adorable. Jay was super friendly and we can't wait to get his fabrics in! 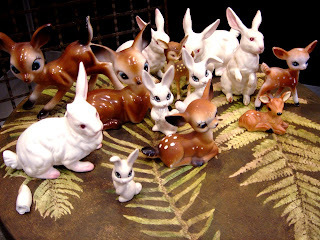 This is a picture of Jay's inspiration for his collection, which is titled "Woodland Wonders". We love it. One bunny lost his ear in transport. Sad bunny. 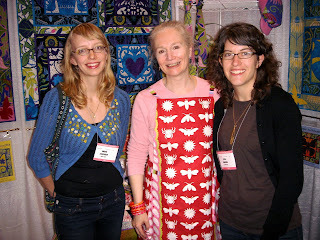 Amy Butler was there, she has two new sewing patterns - an apron and a halter top - coming out soon as well as a new fabric collection coming out in December. She was super-friendly and tall! Doesn't she look like a glowing angel taking us to a heaven filled with Amy Butler everything? Anna Maria Horner has so many great new things going on! We are so excited about her sewing patterns - an adorable paneled skirt, a lovely dress and two super cute bags - which should all be here in late November. She also has an awesome new book out which we will be getting in any day. We can't wait to start sewing all the cute projects. 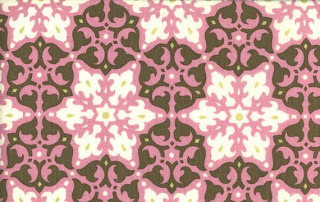 Most exciting is her new fabric collection, Good Folks, that will be out in the spring. 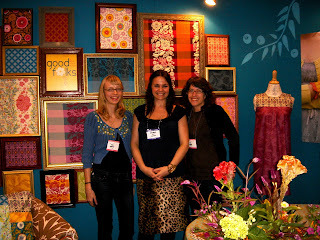 For a sneak peek, check out the swatches framed up behind us in the photo of us above. 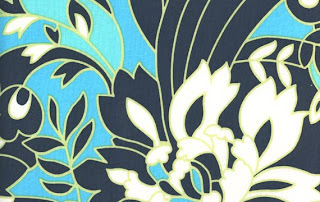 Whats better than a new Anna Maria Horner fabric collection? Anna Maria Horner oilcloth! That's right. Stay tuned. 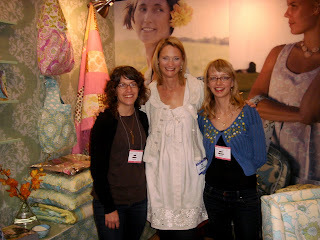 Jaime's favorite booth at Quilt market was Seven Islands, who distribute most of our Japanese fabrics. 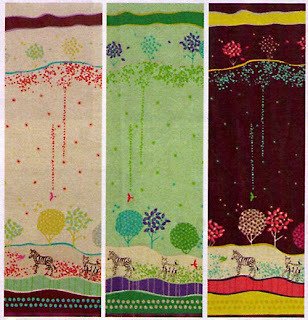 We don't have any pictures because while we were there we couldn't think about anything except the super cute fabrics, but check out the amazing Echino fabrics that are coming out soon. 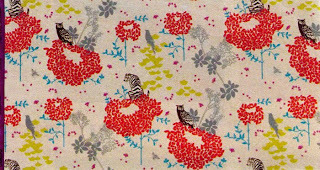 Check out the zebras and deers walking though a field of awesome-ness and the tigers and owls relaxing on giant flowers. We also ordered two Echino bag sewing patterns that are super cute. 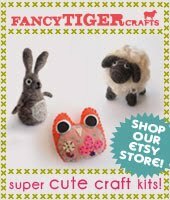 We can't wait to get our Japanese fabric with cats and pretzels, dutch horses, and friendly pandas and kits to make cookies out of felt. Seriously, we spent about 3 hours in this booth. We could have moved in and worn their little slippers made from fabric featuring pigs with spider webs on their butts and their tunics with birds and dew drops. What else could you want? 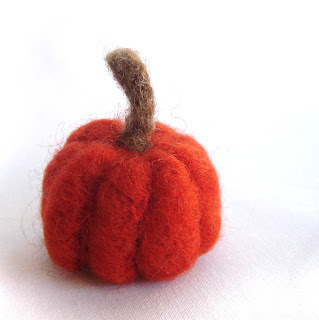 We have some spooky options for Halloween-inspired crafting. 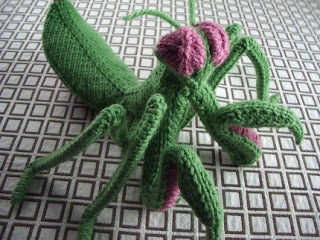 You can knit a creepy spider or praying mantis with our new patterns by Hansigurumi. 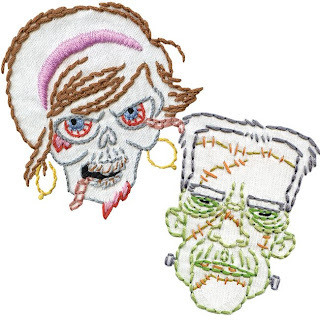 Or if perhaps you'd like to stitch a zombie onto your nephew's onesie, or a tombstone on the pocket of your button-up western, Sublime Stitching embroidery patterns have got you covered. 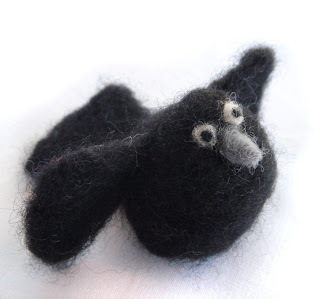 Our crow and pumpkin needlefelting kits would make awesome Halloween ornaments. Also in stock - glow in the dark embroidery floss!! Last weekend we held Camp Pluckyfluff here at Fancy Tiger. 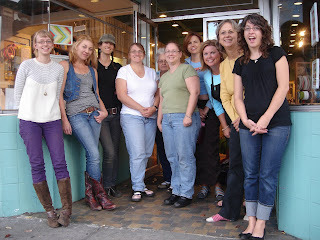 Lexi Boeger came in from California to teach 10 lucky ladies techniques for spinning gorgeous art yarns. It was amazing! 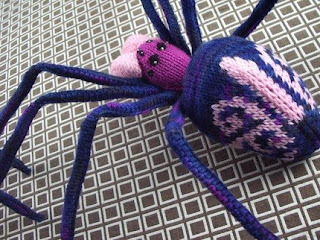 Here are a few of the adorable yarns we made. If you're interested in seeing all of the yarns, you should check out our flickr set here. Enjoy! Are you inspired to spin? Check out our drop spindle class and stop by the store to see our new and improved spinning and fiber section in the loft! 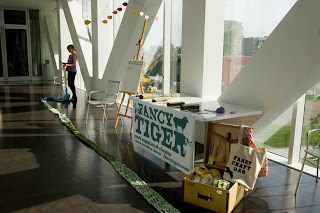 Fancy Tiger in Fiber Arts magazine! 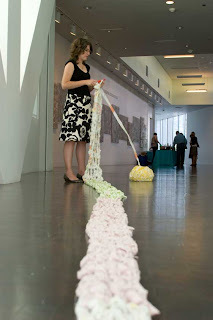 Fancy Tiger was featured in the Nov/Dec issue of Fiber Arts magazine for our participation in the Denver Art Museum's Untitled event where we crocheted the world's longest scarf! 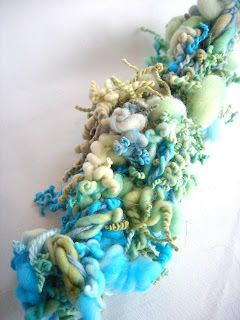 Thanks Fiber Arts magazine and thanks again to everyone who helped on the scarf! You can view more here. 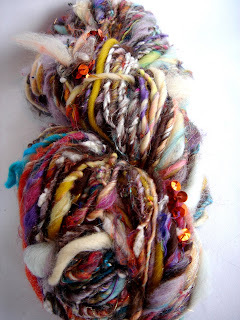 Handspun, locally produced Alpaca yarn! We've just received a new, locally produced yarn! 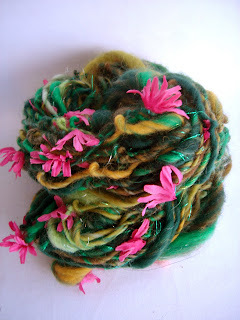 Peg Woods of Pinon Wood Fibers raises all her own alpacas and spins their fiber into luscious yarn. 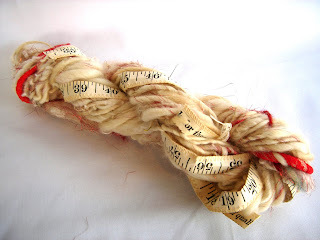 Most of the yarns are plied with beaded thread, and some are done in a Barber Pole fashion. All of them are super cute. The best part are the labels, which let you know exactly who provided his/her fiber for your knitting enjoyment. Ellana is our favorite - what a cute little button of a face! 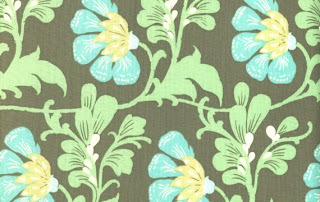 Amy Butler's New Fabric, Daisy Chain! 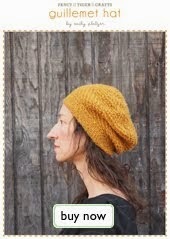 Just in time for the Amy Butler Trunk Show tomorrow! Fancy Tiger in Sunset magazine! 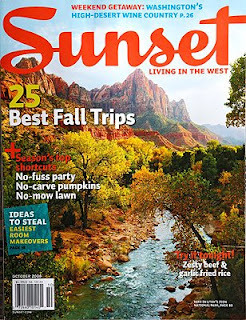 Fancy Tiger Crafts was featured in Sunset magazine October 2008! We were listed under the D.I.Y. stops in Colorado. We are super excited about this - thanks Sunset! The Cutest and Most Teeninesiest Buttons of All Time! I just found the cutest and most teeninesiest buttons of all time. These three little ones were nestled in the bottom of a recent batch of vintage buttons we acquired, huddling together under the big buttons and hiding with the dusty bits of string and mismatched rusty snaps. I almost ate them they are so cute. Perhaps if you were going to make a winter coat for your pet finch or mouse this fancy button would be perfect!